In the Prohibition era, American cocktail enthusiasts flocked to the one place that would have them--Paris. 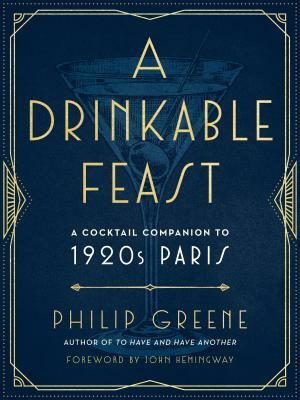 In this sweeping look at the City of Light, cocktail historian Philip Greene follows the notable American ex-pats who made themselves at home in Parisian cafes and bars, from Ernest Hemingway, F. Scott Fitzgerald, and Gertrude Stein to Picasso, Coco Chanel, Cole Porter, and many more. A Drinkable Feast reveals the history of more than 50 cocktails: who was imbibing them, where they were made popular, and how to make them yourself from the original recipes of nearly a century ago. Filled with anecdotes and photos of the major players of the day, you'll feel as if you were there yourself, walking down the boulevards with the Lost Generation. Philip Greene is one of the founders of the Museum of the American Cocktail in New Orleans and author of To Have and Have Another: A Hemingway Cocktail Companion. He is a sought-after speaker on topics within cocktail history, as well as a mixology consultant for restaurants and institutions across the world, and he is a regular cocktail columnist for The Daily Beast. He lives in Washington, DC, with his wife and three daughters.